Our old friends (and occasional allies) at Conduit for Action are at it again. This organization is parroting the old (and discredited) line that Issue 1 is doing something which should never be done — placing a value on human life. Of course, that charge is absurd once you look behind the catchy phrasing. It is troubling that a supposedly conservative organization is parroting the talking points of trial attorneys in this matter. It’s even more troubling that this organization refuses even to discuss this issue with others in the conservative movement. To recap our debunking of the old canard that “you can’t put a price on human life” – it happens all the time. That is the whole point of juries awarding monetary damages in civil cases where there is a loss of life. Conduit showed that it is not consistent on the issue of life being priceless with its attacks on Dr.
Cole Peck for equating the Medicaid reimbursement rate for lifesaving services with a cap on non-economic damages in court cases. Conduit says that the Medicaid rate is not a value of life, but a value of a doctor’s services. True enough, but when these services are used to save a life, there is an implicit value being placed on life. Dr. Peck has an excellent point – there are many places in society where the value of saving a life is weighed against costs, whether monetary or otherwise. Some observers contend that expanding Medicaid will save lives. This, of course, comes at a monetary cost, and Conduit for Action has been vocal in opposing Medicaid expansion. That means that Conduit has decided that the cost of saving a life is not worth the tax money it would cost to expand Medicaid. That is a trade-off that is made every day in public policy (how low should a speed limit be, for instance), but it is one that is in stark contrast to Conduit for Action’s attack on those who support Issue 1. As we have discussed on TAP in the past, this is not Conduit for Action’s first foray into the swamp of error on tort reform. This organization has fought some fine battles for the conservative cause in the past, but they are also consistently wrong in their reasoning on tort reform. Both Dan Greenberg, when he worked for the Advance Arkansas Institute, and I have attempted to contact Conduit for Action and ask them about this. They have refused to engage in conversation. When the people who run an organization behave this way, it leads one to believe they are not interested in educating the public. If they were, then they would be willing to discuss their views, possibly changing them if they are proven to be in error. 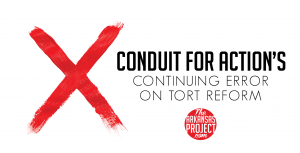 Instead, Conduit for Action’s behavior when it comes to tort reform indicates that it is engaged in something much closer to disseminating propaganda. That is allowed by the Constitution, but those who run the organization should drop the pretense that they are engaged in anything conservative. They should also jettison their tax status under Section 501 of the Internal Revenue Code, especially because they’ve already jettisoned their principles.